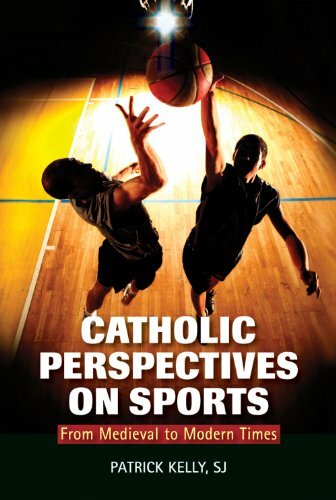 According to author Patrick Kelly, Catholics have always engaged in play and sports. During the Middle Ages, games and sports were played on feast days and Sundays, and these activities are shown in prayer books, in woodcuts, and on stained-glass windows in churches and cathedrals. Contrary to the view of some sports historians, pre-Reformation Christians did not "loathe the flesh" but instead insisted on the unity of body and soul. Book jacket. author of five other business books, including The Open-Book Experience. "No Puritan Pall Hovered over Sundays"
"The Earth Is Shaking with Flying Feet"
"The Spirit Is Bound with the Flesh"
"I Have Run the Race, I Have Fought the Fight"
"Ordinary People, Just Frankly Enjoying Themselves Like Human Beings"
"A Form of Gymnastics of the Body and of the Spirit"